This post is in response to some questions I’ve received about drying coffee grinds and then how to store them. This becomes important when you are collecting large quantities of used grounds, or large enough that you can’t use right away. Used coffee grounds do not store too well due to their high water content; in this state they are primed to decompose which is a great thing for everything but long term storage. Get yourself some used coffee grounds. If you are unsure of where to go to get them, your local cafe is a good place to start, and if still in doubt then check out the Ground to Ground Map on Google for more locations. The grounds you collect should be fresh and not at the point where they have started to mold. If they start getting a mouldy smell, and go blue or white (or blueish or green), then those used coffee grounds are perfect for adding to the compost but not for drying out and then storing. Find one of those bakers trays with the crisscross gaps in the base. Cover the base with dry newspaper (and removing any staples), about 6 sheets thick. 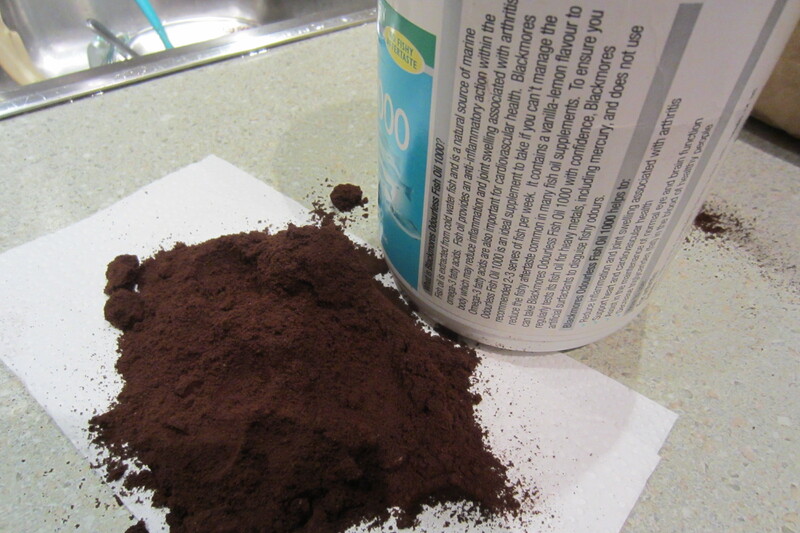 Lay the coffee grounds over the newspaper, keeping the grounds no more than 2-3 inches (5-8cm) thick at a time. Place the tray in a sunny spot with noticeable air flow. That should be enough to get you started. Now just replace those strips of newspaper every day or so, and mix the whole lot up so the wetter grounds at the bottom are given a chance at the top. You will know the difference between wet and dry grounds by feel and by color. In case you were wondering, there are other ways to dry used coffee grounds. I have used a convection oven (OK for a handful), a microwave (started emitting a weird smell that stayed there for weeks), an old hair dryer (you need to be really desperate to do it this way, and I was! 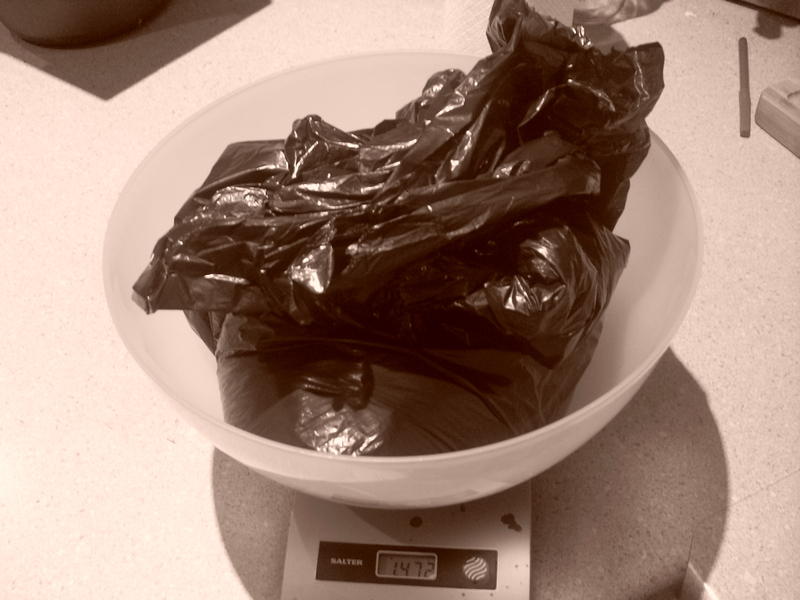 ), and grounds in a cloth bag in the clothes dryer (again with the weird smell and what a waste of electricity). So do it in the sun and wind as outlined above if you can. And for all of you that prefer the visuals, we have those for you also. The plastic bag full of used coffee grounds. Slightly damp as you would expect with plenty of coffee cakes. The old screen door I’m using to break up the coffee cakes and get a heap of air through the whole pile. Lay the grounds over the screen and start pressing them through onto the tray below. Do check that there are no stray pieces of metal sticking from the screen, because you don’t want to be pressing down on it and then getting a piece of metal stab you under a pile of grounds coffee. No no no! A lovely, fluffy pile of used coffee grounds waiting to be dried by the sun and wind. Here we have a video of drying out grounds without putting them through the wire mesh. The results were not as good as what I’ve outlined above, but big thanks to my little helper! Still wet, this heap of used coffee grounds has been prepared nicely for drying. And after a couple of days in the sun, with a nice breeze, most of the moisture has evaporated out, leaving an end product that very much resembles freshly ground coffee. Powdery fine used dried coffee grounds falling through the air. Now once it is all dried off, time to get it stored. Here are some examples, and all work well. 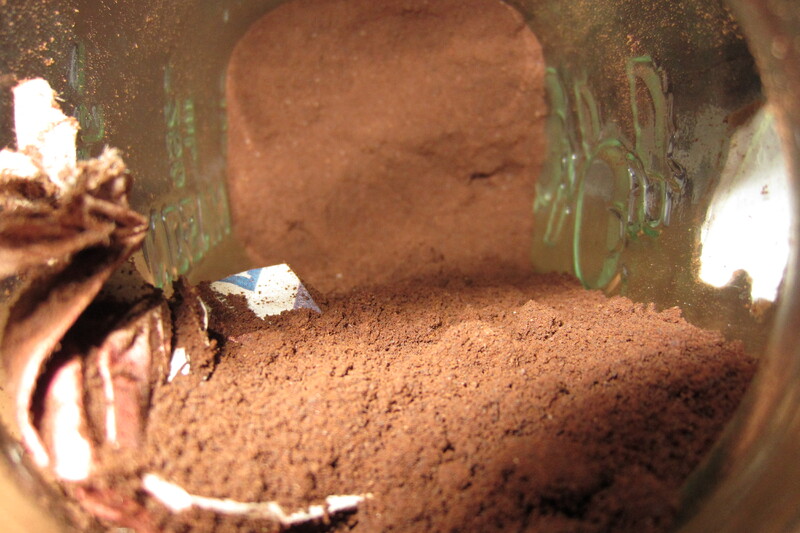 Dried coffee grounds can be stored in plastic, a glass jar, or even paper packaging. These are the containers after a week. There is no evidence of mould or of the grounds getting lumpy, and they smell like fresh coffee. I’m using newspaper at the tops of the jars to absorb any remaining moisture. 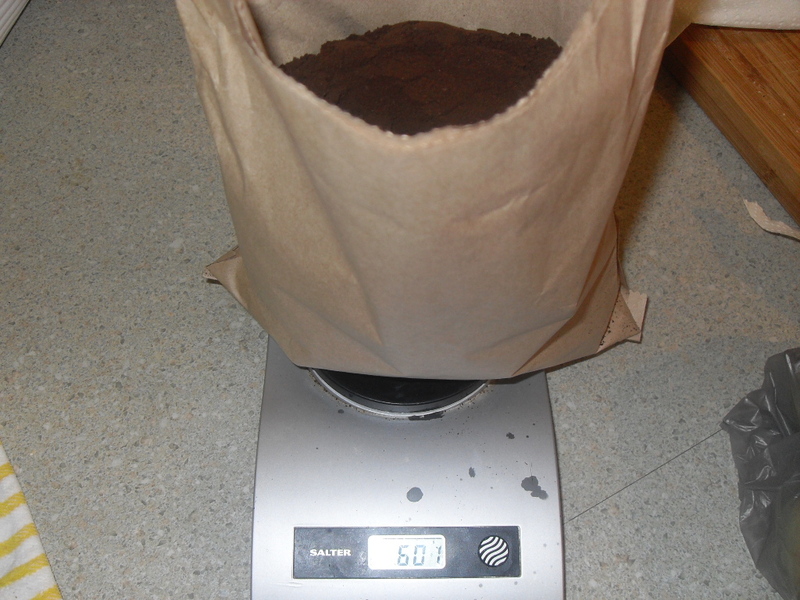 To get an understanding of how much moisture there is in used coffee grounds, below is a bag that was weighed before drying – 1.47 kilos. And here it is after been dried out, now weighing 600 grams. For How Long Can You Store Used Coffee Grounds? Pleased to answer because as of this March 2012 update, I have kept these same used coffee grounds for almost a year now and they seem to be doing just fine, as per the photos below. From the same plastic container as earlier in the post. The grounds still smell like coffee and have no trace of mold or decay. They are very dry and coarse. 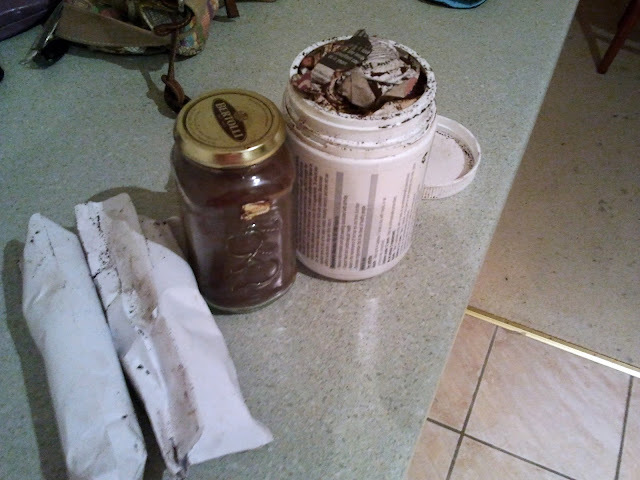 And the year old dried coffee grounds in the glass jar – doing nicely, with no use by date that I can think of. Next update March 2013!! And here is the finished product, a bag of dried used coffee grounds. The Ground to Ground logo is stamped on the front. And a little marketing info on the back. So what are some of things you could do with a bag full of dried used coffee grounds? Tags: dried, drying, store, used, used coffee grounds. Bookmark the permalink. Love your info. As we just bought a home and would like to start our own garden next year. So am collecting my coffee grounds as well as my egg shells to help out with our project. Thanks for your info. Take care and God Bless. I make coffee in paper filters. I then leave the used filter/grounds in a tray for a day or so to dry out. I then tip out he coffee into a 2-litre ice-cream tub until it is full. Having dried out the grounds, they then need to be re-wetted when added to the compost bin. If I tip them out into a pile and use a pressure-sprayer, the the water will run off the dried grounds, and I have to rake them over with a small garden ‘claw’ in one hand, while spraying water on them with the other. I recently heard dried used coffee grounds can be burned like incense to keep mosquitoes away … has anyone used this method? Hello! thank you for this info! It’s awsome! I’m drying the coffee in my garden and the flies had approached to the coffee. Would that jeopardized the final product when they’re dried. Hi, I recently just found out about using used coffee grounds for gardening! Thank you for creating this amazing blog. I would just like to ask, will the overall quality of the coffee grounds decrease when using the pot method? Is it also possible for it to burn and become unusable? Thank You for your support. I Am pleased you enjoyed Choices. Walking in Spirit is the only choice we must make. Wonderful to meet another Spirit on the path to freedom. By the way this Spirit enjoys coffee and our worms love the grounds. Awesome to hear. Thanks for stopping by! This site is so informational and inspiring. Have been adding coffee grounds from the local Starbucks to my compost piles…..and the earthworms have been pretty happy about that too! That is great to hear Anu, thank you for writing to me. If you need a hand just let me know. Found your blog today and love it. You talk about the grounds not getting moldy a lot. What happens if you use grounds or used Chinese herbs with some mold? Is it very harmful to the plants? It is so dry in Colorado that I can dry out the grounds just by keeping the container open for air and I store in large buckets. My husband brews lots of Chinese herb tea and I am thinking that I should use the herbs for fertilizer, but I have to use it in the garden immediately. It doesn’t dry out without getting moldy. Thank you so much for the wonderful blog. Any advise would be very welcome! Hi Rhoda! If you have organics with mold then you can still use them just fine. When that happens to me I’ll add them straight into a large pile of compost out the back, and dig them in a little. I tend not to use coffee grounds directly on the soil if they already have a lot of mold on them, but it is more for aesthetic reasons than for anything else. Compost is great to use for those things, and the herbs you mentioned, because you still make use of it, just not immediately. Hope that helps, and thanks for stopping by. Thank you Saskia, sounds like you would have some good advice to pass on to your fellow used coffee grounds practitioners! Would you be interested in writing a few words for this site and some photos of the benefits in action? also can you give pointers on paper packaging for dry reused coffee grounds? thanks for posting these helpful tips, i would like to ask if heating the used coffee grounds on a dry cooking pan will be effective in drying the used coffee grounds? is it possible to emit fragrant coffee aroma when heating it on a cooking pan to make the ground beans dr? lastly any suggestions on cheap packaging so that i can resell my dried ground coffee on a community market? thanks! You can get them very hot in a pot – as you can see I was able to heat them up to almost 300 Fahrenheit. Now having done this a couple of times, it is still not as good a way to do it by the Sun and wind, because you can only cook small amounts at a time. But if you don’t have either of those two then what choice do you have (although it looks like you are in the Philippines?) For small quantities it will be fine, anything close to commercial amounts is not practical. If you had a commercial grade air heater then maybe that would work OK.
As for the aroma, yes you will get a nice smell out of it to start with, but will not last for long. The last question Hans is about the packaging you need to sell used coffee grounds – I know someone that uses polyurethane bags and this works well for them, although if you can dry them and then turn them around quickly, maybe try thick paper bags? I keep my dried grounds in paper now and after a while the oil from the grounds seep out but that is after maybe 3-6 months. Would you be interested in getting in touch with someone here in Australia that is already selling a coffee compost?? thanks for the reply! what i did to dry the ground coffee beans was to cook them in the frying pan without oil , yup i did it in batch so it is a little time consuming. I was concern about the quality of the ground coffee after cooking them in the frying pan / wok. As for the packaging, yes i am currently thinking of placing the ground beans in the plastic bottles to sell for additional income and add new items in our small coffee shop (for a very minimal fee). Since start of operations of our coffee shop, most of the ground beans are thrown to the waste bin, i just started to gather the used ground beans these past few days. Well Hans I wish you the best of luck with that and always happy to post an article about what you are doing with coffee grounds, especially the making money from it part. There is a great deal of interest in how to make money from used coffee grounds, seeing how there is just so much of it that is available. I can’t believe my good luck at finding your blog! Thanks so much for such a practical, easy-to-follow and fun-to-read page! I’m looking forward to seeing the results in my carrot and tomato plants! I live in an apartment building and had pretty much given up on the idea of composting. But this year, I decided to try growing some food on my balcony -lettuce and basil- and on the rooftop (a forbidden zone, don’t ask me why) -tomatoes, carrots and green peppers. When I read that used coffee grinds could give my non-flowing tomato plant a boost, I decided to give it a try. I hope that learning how to dry and store the coffee grinds will be the start of a small compost my neighbors and I. Thanks again! You are very welcome Kim and thank you for writing in to me. I’ve found that drying the grounds is a great way to store them for when you really need them, such as a handful into a tomato pot, or into compost. Keep an eye out on how much you use in pots, as you wont need heaps when growing plants in this way. Please let us know how everything is growing, and hope you stop by again some time soon! I just happened to come across your blog this morning while trying to learn the benefits of using coffee grounds in the garden, and how to dry out my coffee grounds. I drink approximately 2 pots of coffee a day, so you KNOW I have plenty of coffee grounds to work with by the end of the week! LOL! I was wondering though… what would you suggest to those of us (like me!) who live in colder climates and get harsh winters, to dry out their used coffee grounds in the middle of winter? Some places, like where I live, in the winter months, I’m not sure that it would be wise to set the coffee grounds outside… even in the sun… for fear they may freeze instead of dry LOL! Have you ever tried drying them using a dehydrator… since it sounds like the ultimate goal is to remove moisture… would using a dehydrator work for people like me, wanting to dry out used coffee grounds indoors in the winter months? I have some of the same problems, being that in Winter it is almost impossible to dry the grounds outdoors. I normally do all the drying over the Summer months with the hope it lasts me for the whole year. I can’t say I’ve used a dehydrator (have used a clothes dryer, the microwave, and an oven), but it is a great idea well worth a try. Do you have one that you can experiment with, because it would be great to add that as an option. Like I mentioned before, you can dry them in the oven really well, sure it uses more power to run but if you need those grounds you need those grounds! I do have a dehydrator that I could try it out on. I was thinking about trying it out here in a few weeks (after things that are going on in my personal life settles down some lol), then sprinkling the dried coffee grounds on my indoor herb seedlings that are starting to grow, but appear to have some kind of tiny white bug things rooting around the soil, to see if the coffee will get rid of those pests. I have no idea what they are, how they got in there, or anything, but I’d hate to toss out every pot of herbs over these things, even though, for the most part, the herb sproutlings still look healthy and green. When I can get around to trying out the dehydrator to dry out coffee grounds, I’ll letcha know how it goes! Do you think using the coffee grounds on my herb seedlings will help get rid of these pesky pests? Well it seems to help once the grounds are broken down but that takes some months to happen. I’d suggest you add some neem oil or diatomaceous earth to sort out those little buggers. What is the other alternative/fastest way to dry coffee ground? May be using machine or other tools? The fastest way I know of is to lay them onto a tray lined with paper. Lay them out about 2 inches deep somewhere in the sun with a gentle breeze. That is the quickest way I have found, even better than a drying machine. Also, when you use a machine, it is too easy to burn the grounds, and they seem to loose something as a result. How about using machine like this? One of the reason why using machine, if I want to reproduce it in larger scale. Would you mind send me your email? I might have some other question for you. Connie – You will get mold with coffee grounds and this is a normal part of the decomposition process. You can find information about this from an early post about coffee grounds and mold, and also from a previous comment reply about slime mold. thanks heaps for going through how to dry coffee grounds in so much detail. I’ve been collecting coffee grounds for three years and always wanted a way to store them, because you’d know that you don’t always need to use them right away. will usually do a compost pile every two months so need to keep plenty of coffee grounds as the main source of green material. signing off, and thanks again. What about used coffee grinds going into the worm farm – Would that work? It would work very well Darren. 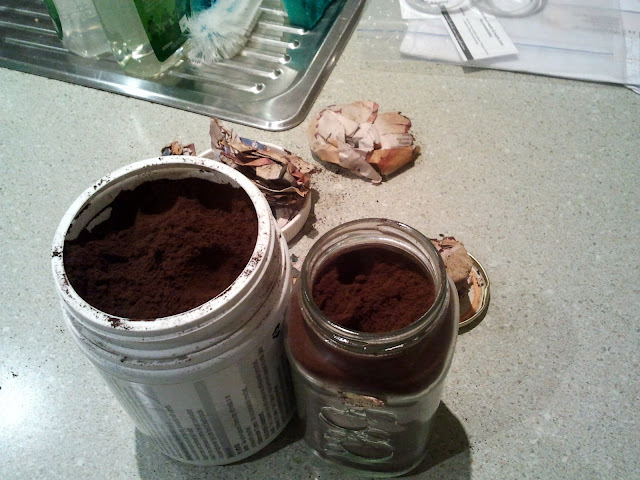 I’m using coffee grounds in up to 25% of the worms diet, with great results. You can check out my video on using coffee grounds in worm farms and if at anytime you need more information just let me know. Just came across your blog via Lisa (frog Dancer). Twice in as many weeks!! Nice to ‘see’ you again. Likewise! I checked out your site and was impressed with that patchwork that you do. Very skillful. Thanks for such a great blog. I am amazed at how many ways there are to use coffee grinds. I particularly like the idea of using them for compost. Your step by step directions with pictures makes it easy to follow. I will be back often. Why thank you Constance, that is so good to hear. The only real thing that is difficult about drying the grounds is to keep them dry. I’ve had a few batches left too far out from the balcony when there has been a light rain and they pick up moisture like a sponge. Hope to see you again soon. Cheers, Shane. I can’t believe I found someone that is more into used coffee grounds than me! Thank you. Cheers Julia, thanks for the post reference. When I started collecting coffee grounds for the garden, there was not a great deal of information on the topic. So decided to build a site that could be used as the reference point for all things coffee grounds, because when people learn about the great things you can do with those grounds in compost or fertilizer or other things, they tend to want to do something about the current problem. Many many tonnes of perfectly good natural fertilizer is being sent to landfill each day! I used THE worm tea. The. I need another cup of coffee…. Hahahaha. Yes indeed, I am brewing up another 25 litres!! You forgot to say that having a bag of the dried coffee in your kitchen makes the room smell wonderful! Thanks. I used to worm tea on my herbs last night and I’ll play with the coffee grounds today. Great to hear – and yes coffee grounds are very effective at controlling odors and will make the place smell like a cafe. Enjoy the worm tea and coffee grounds, and am sure I’ll see you at the next meeting. Cheers, Shane. Three months and counting! How long will the grounds stay dry like this? I can’t say yet Richard. The ones I dried for this post are still OK to keep in store, with no sign of mold.